Many beginners are acquainted with knitting needleswith the creation of the simplest products, for example, doll things. 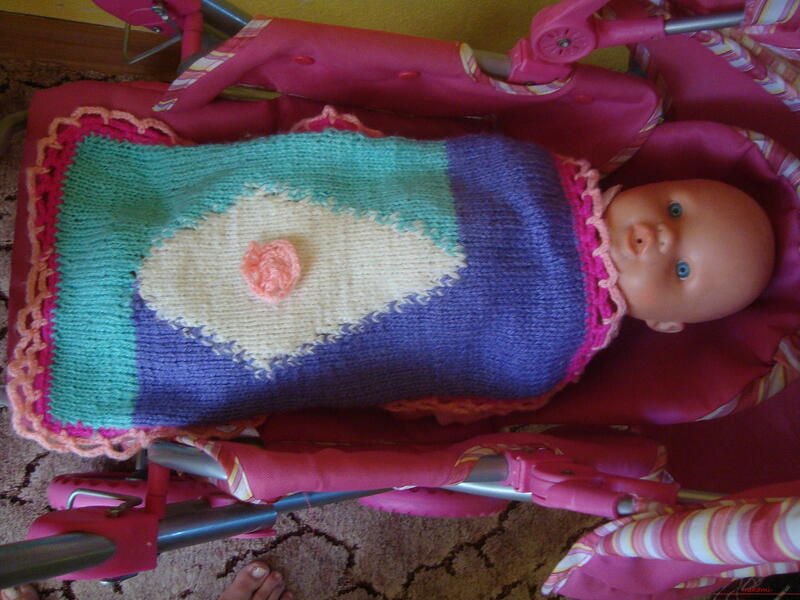 Knowing the basics of knitting, that is, face and purl loops, you can create an interesting miniature blanket, just for a small doll. This blanket will be pleasant to knit even to children of 7-10 years old, or to young mothers who only get acquainted with knitting needles and want to please their daughters. Spokes of medium size, approx. 3-4. Yarn of several bright colors: two colors are combined in the basis of the product, the triangle in the center is tied with the third color, and the strapping along the edges is created by the fourth shade. To create a blanket measuring 25 by 40 cmit will take about 2 hours for an experienced master, and beginner needlewomen may spend 2-3 pm. If you are just gaining experience, then the mating may turn out to be non-uniform, some loops are loose, and others are tightened, but on the reached it is not necessary to stop, an equal fabric is obtained by needlewomen only in time. All the cloth is knitted according to a simple principle: even rows form facial loops, and all odd rows are sewn with the wrong loops. The result is a smooth surface, but to somehow diversify the baby blanket you need to use a combination of several colors that match each other. The smooth surface will not lie exactly like a blanket, it will necessarily curl up from all sides, so you will need a crochet, it will not only perform as a decorative finish, but will also help tighten the edge of knitting so that the blanket takes its final form. First, dial 50 loops. To do this, fix the thread with one hand between the thumb and forefinger, the ends of the thread must be held by the other three fingers, pressing them to the palm below to the wrist. Connect the two spokes together and press the thread near the thumb, form a loop from the stretch and pull it in the opposite direction. Do this 50 times so that the width of the blanket is suitable for the middle doll. Taking out one spoke so that all the loops remain on the second spoke, start tying the loops. The first loop is always removed, and the thread is sewn from the second loop. The first row is odd, so untie it with the front loops. The principle of their creation is quite simple: with the spoke in the right hand, you loop the loop from left to right, that is, you twist the loop a little, then take the yarn catch and take out the new loop from the thread to the right knitting needle; It will not dissolve, because through it a new loop is already tied. Such an algorithm of knitting is done with the following 48 loops. The last loop in each row is tied according to the principle of the purse element. 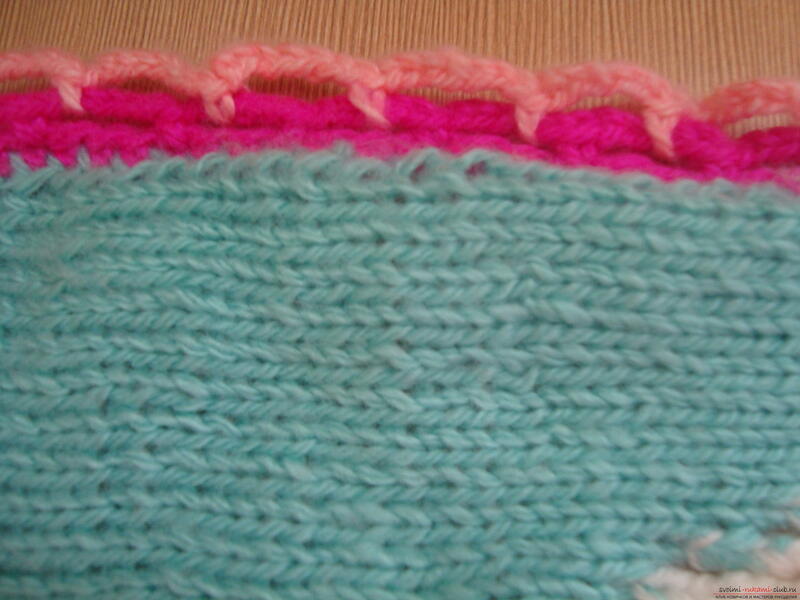 Turn the work over and continue with the same yarntie the second row using the purl loops. To create them, poke the loop along a convenient opposite direction (from right to left) and grab the thread, then pull the yarn in the opposite direction to create a new loop. Thus, tie all the remaining 49 loops, provided that the first knitting element is simply removed to form the right edge of the fabric. Spray about ten centimeters of cloth in one color, and in the next step, knit a diamond-shaped middle of white and add a third color that will fill the second part of the blanket. Tie a thread of white to the 25th loop and when youyou will reach this place on an odd number, tie her two central loops. Then add yarn of one more new color and tie it from the 27th loop to the last, thus, connect other shades that will help to diversify the doll's sleeping accessory. Now you need to sew the loops with those threads, the color of which is on the previous loops, but the white yarn will each time grab a pair of extreme loops so that the diamond-shaped pattern expands. That is, on the next front row it is necessary to tie a white thread from the 24th to the 27th loop, and on the other stage 23-28 loops, etc. When the size of the diamond overlaps 2/3 of the width of the future blanket, go to the narrowing of the pattern, and in each row, start reducing the white loops, threading them with threads from the outer colors. 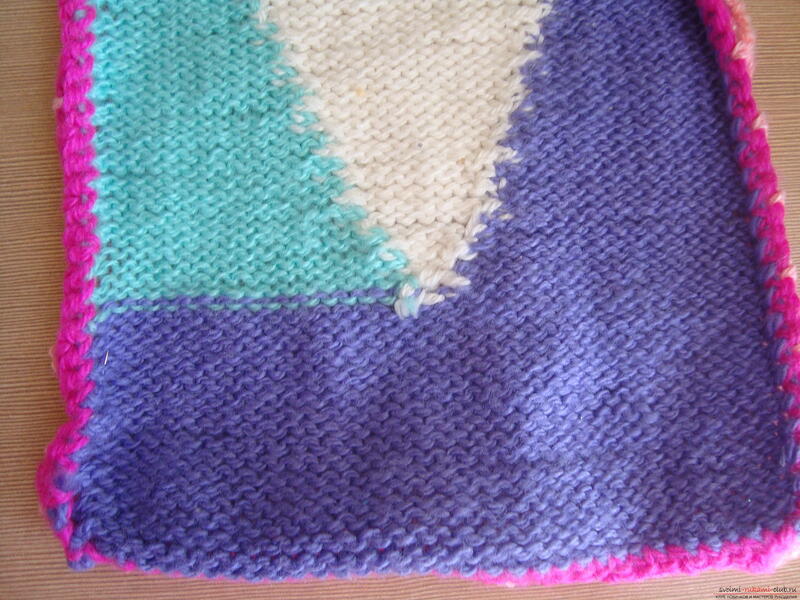 Gradually narrow the diamond to two loops and later tie the whole next third color, that is, this blanket began to knit with a purple color, and ended in a turquoise tone. Spray a few more single-colored rows so that the size of this part coincides with the first round of knitting in one color, and then the blanket will have a simple symmetry in color. 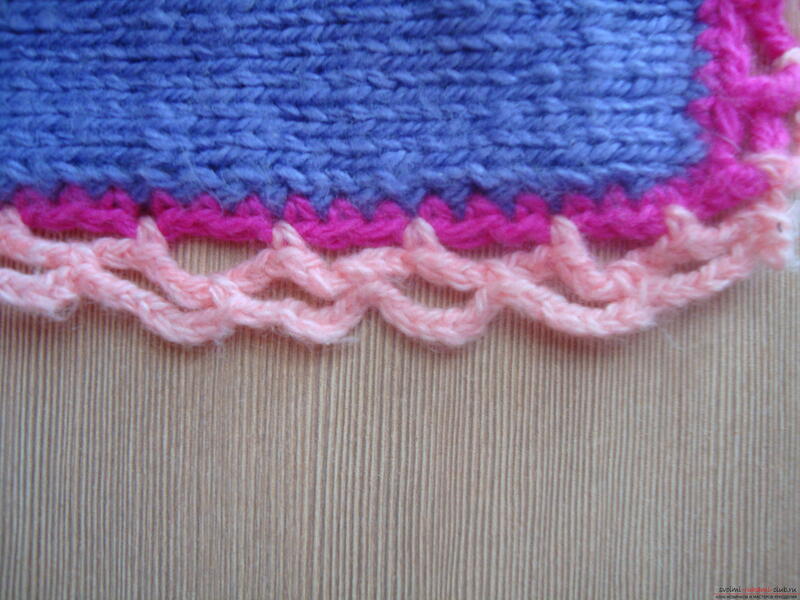 To ensure that the edges of the product are not tucked, it is necessary to tie them with a crochet. For tying, select the yarn with a different shade, for example, pink. Thread the hook into each end of the loop of the row and tie a bar without the crochet. The principle of strapping is such that you have to hook the end of the two strands, yarn the yarn, pull out the loop and then re-thread and loop the loop - and so repeat along the entire perimeter. In order to round off the corners, it is necessary in these places to make the harness tighter and at a distance across the gap in a row. Next, create a lace trim. For her, dial five air loops and secure them in 2 cm, then re-dial the air loops and tie them through the distance so that the arches form. Such azhur can be tied in one or two rows. But in the second row they cling to the middle of the arch of the first row. 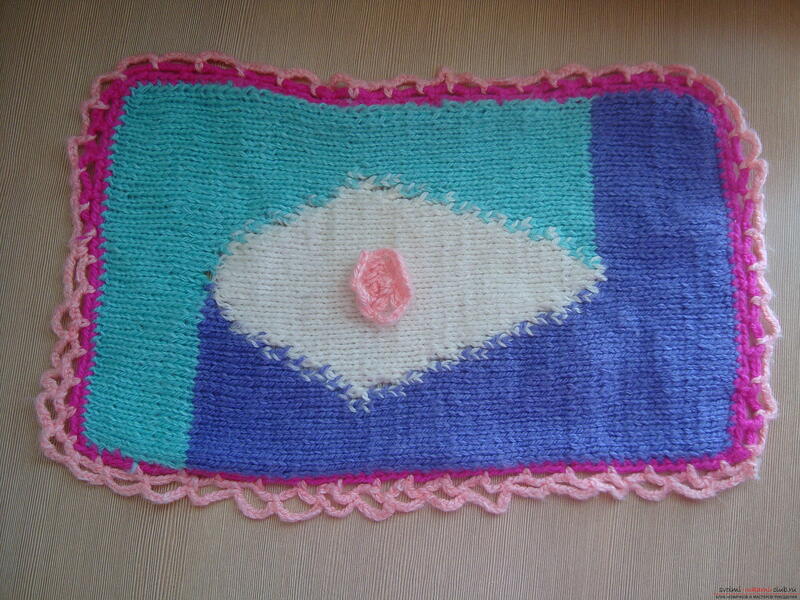 The middle of the blanket can be decorated with the simplesta flower that is knitted along a spiral of columns with two crochets and air loops. 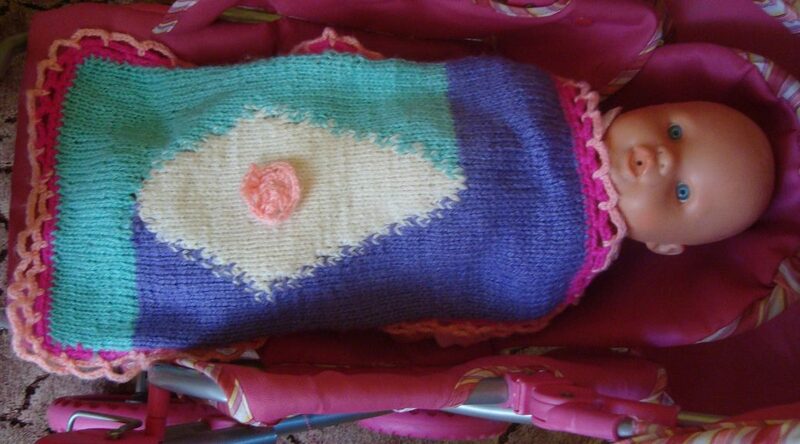 A blanket tied by one's own hands will cover your favorite doll, add comfort and embellish a stroller or crib. We create a box for the doll with our own hands. Original materials, effective methods.